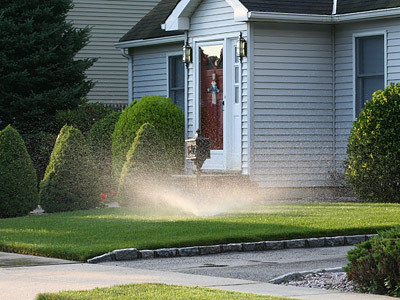 The health and beauty of your landscaping greatly depends on your irrigation system. When professionally designed and installed, it will provide the much needed nourishment to your landscape. If you want to enjoy all these benefits, you need to hire a competent and experienced contractor like us at Egan Landscape Group. Our company is composed of people with decades of experience in the landscaping industry. We are experts in various aspects of landscape development, including the design and installation of irrigation systems. Every system that we install is carefully designed to meet the needs of our customers. We consider several factors when working on the design plan to ensure the efficiency of the system. We take note of the softscape elements, topography of the area, the existing structures, and the customer's budget to help us with an efficient design. The watering systems that we have designed and installed for customers in Plymouth and the surrounding areas are proof of our competency in this field. We can also tackle repair and maintenance jobs at reasonable rates. As licensed and certified installers, we can handle all kinds of landscape irrigation projects, whether residential or commercial. Our expertise in this field is honed by our experience in installing and maintaining irrigation systems. In fact, most of our landscape installation projects include the design and installation of irrigation systems, as well. We have even built drip type, bubbler, and other types that can work on large lawn areas and sports facilities. We are the company of choice for those who are in need of a reliable repair and maintenance service provider. Our customers are assured of fast services and effective solutions to their irrigation maintenance concerns. We can provide immediate solutions to simple repair and maintenance problems such as, replacement of damaged or burst pipes, repair of malfunctioning sprinklers, and identifying water leaks. These jobs are performed by our certified technicians, so you are assured of working and long-lasting solutions. At Egan Landscape Group, we have access to premium products that are proven durable, water efficient, and long-lasting. We get these products from trusted brands like Toro, Hunter, and Rain Bird. Their products are packed with innovative and modern features. We also have complete tools and equipment for the installation. With these resources, we can easily design a fully automated irrigation system that is not only water efficient, but also tough and reliable. Contact us today at 508-224-9300!